Nepal 11 Entertainment Calls For Miss Nepal US 2018 Applicants - Integration Through Media ....! Sisriksha Dhakal, LOS ANGELES: Nepali American most prestigious beauty pageant Miss Nepal US had successfully leaped over 5th edition. It is calling interested participants for gearing up into application. Interested women of age-group 18 to 25 can apply for ‘Nepal 11 Entertainment Miss Nepal US 2018’ before July 30th, 2018. The pageant was initiated back in 2011. 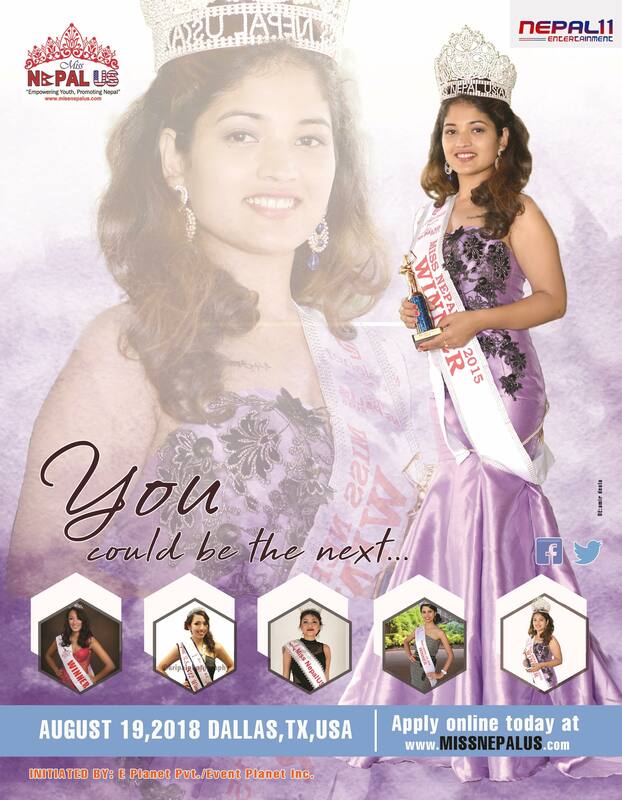 Miss Nepal US objective rests on two pillars: personality and leadership development. The organizer’s are basically in search of a personality that combines beauty, brain, confidence and a positive mind and one who will be able to present Nepal American as its worthy ambassador to the outside world. A strong Miss Nepal US must also possess interests in empowering Nepali American women; engage in social service and in promoting issues related to women. The audition is set to be held from May 12 to June 29th, 2018 in New York. The press release was issuing at NY, where organizers notified pageant as an opportunity for applicants to lead a life as role model and celebrity. It is a platform to mend mentally and internally mastering confidence. In 2011, to give the Miss Nepal US pageant a more professional approach, senior members of Nepali American who was involved in organizing first Miss Nepal US Beauty Pageant established Amit Shah, Nepal 11 Entertanment, which now annually organizes Miss Nepal US Beauty Pageants. The grand finale is scheduled for August 19, 2018, in Texsas. Each year the Miss Nepal US pageant is known for adapting and bringing awareness regarding socio-cultural agendas. All Nepalese women, age between 19-29 who are residing in USA can participant in 6th Miss Nepal US 2018 event. Furthermore, in an effort to strengthen the Nepalese-American Youth relationship, to give opportunities to those who want to help Nepal, and/or have elaborately formulated relief effort concepts to support the Nepal earthquake victims, this year we are also opening our platform to the American females of all races, ages 19-29, where they will be competing for the exclusive sub-title of Miss Nepal US – Ambassador. ● Must be leaving in USA and have eligible document to travel in & out of USA. ● Must be of good health and moral character. ● Must be interested to raise awareness of the current natural disaster occurring in Nepal. ● Must have previous leadership experience (school, college, community) and/or have a strong passion to develop leadership qualities. ● Must have the willpower to grow with, adapt to, and find balanced solutions to various challenges. ● Must submit application online at www.missnepalus.com and must pay non-refundable application fee. Short listed candidates based on their application will be contacted for first phase of the audition and they will have an option for skype/phone audition or live audition at convenient location set forth by the organizers. Based on following criteria, contestants will be selected though audition process.